The total sum of debt obligations of national joint-stock company Naftogaz Ukrainy as of June 30, 2018 came to UAH 42.555 billion, which is 28.3% less than as of late June 2017, according to a draft offering memorandum for the company's eurobonds, a copy of which has been sent to Interfax-Ukraine. At the same time, the company said that the lion's share of liabilities - 78.5% - is short-term. Based on the expected hryvnia exchange rate in the draft national budget for 2019 projected at UAH 29.40/$ 1, the amount of short-term liabilities is $1.14 billion. The average cost of borrowing in national currency is 19% per annum (debt is UAH 17.577 billion), in U.S. dollars - 8.7% per annum (debt in the hryvnia equivalent is UAH 16.359 billion), and in euros - 2.6% per annum (debt in the hryvnia equivalent - UAH 8.619 billion). According to Naftogaz, the majority of debts are secured by pledges in the form of natural gas or receivables. 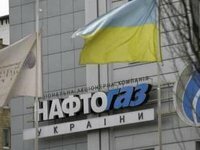 Meanwhile, Naftogaz indicated among the risks that the company may experience a decrease in liquidity during the summer due to the extension of public service obligations (PSO) to sell natural gas to households, religious organizations and heat energy producers at a reduced price until May 1, 2020, as well as the need to transfer dividends to the national budget.